Optional SmartSolar pluggable display is available but not included. The Smartsolar 150/60 is a great choice for controlling up to 860 watts of solar panels at 12V, 1720 watts at 24V, or 48V at 3440 watts. With maximum open circuit voltage of 150 volts. It automatically selects between 12, 24, and 48 volts on the output (software tool needed to select 36V). Should the PV input exceed the rating, the controller will simply limit the the throughput to the rated level. 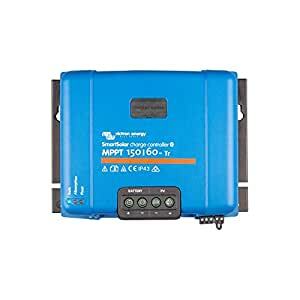 Besides great build quality and a 5-year warranty, the Smart Solar has a number of unique features: The Victron SmartSolar MPPT 150/60 can be connected right out of the box, and a rotary switch lets you choose between 8 preset battery type profiles. More extensive configuration and monitoring is possible via the free app on your smartphone or tablet. Being able to access 30 days’ worth of history, including daily yield and the amount of time spent it each stage, can be valuable for managing your energy collection and use. Victron Color Control GX â A color display panel that connects to Victronâs battery charger, inverters, and battery monitors. Victron MPPT Control â A remote for Victron MPPT controllers with a VE.Direct port. VE.Direct to USB Adapter – Connects Victron MPPT controllers with VE.Direct ports to connect Victron MPPT controllers with VE.Direct ports to a Windows PC or Mac OS X. After much reviewing I decided on this controller – and very glad that I did! Really like the smart features, including the Bluetooth connect to phone which I use very often, it makes it very convenient to monitor both sets of batteries on my boat! Not sure why someone commented it doesn’t work with Android – that’s simply not true as I use it on my Android S8 smart phone without issue, the app is available in the play store. When you first download the app and it connects to your charge controller it will most definitely update the firmware – but again, I’ve had zero issues with that as well. I should mention, I have these (I have two, one for house batteries, one for engine start batteries) mounted in my boat, in the engine compartment, each controlling a 100w flex solar panel. They have worked flawlessly and I would recommend this product without hesitation! They do exactly what I need them to do and require zero interaction once set up! Victron components are incredible. I already had the BMV-712, and just added the SmartSolar 100/50 to add solar power to my RV. Used with two 100w Renogy mono panels, with the plans to add two more soon. The build quality of this solar controller is incredible, it feels like you’re getting what you’re paying for. As soon as I connected the solar panels, the unit powered on, even though I hadn’t connected the battery yet. This surprised me a little, I figured it would only be powered from the battery side, but if it does get enough power from the panels it will continue to run even if the battery is disconnected or battery-side fuse is blown. So you’ll want either fuses or breakers on both sides so that you can power it off completely if you need to. I was also very pleased with the fit and finish of the Android VictronConnect mobile app, and how easy it was to not only connect over Bluetooth, but to view data and manage the settings. There is no complicated pairing involved, it just scans for ones that are within range. I want to figure out if it’s possible to set a password on it, because I don’t want someone walking by and messing up the settings causing my battery to explode! But the app UI is beautiful, easy to use, and quickly conveys the important information. The history view is nice, as you can see how much power (Wh, max W, and min/max V) was drawn, as well as how much time was spent in bulk/absorb/float. You can also export the history as a CSV directly from the mobile app and email it or save it to your cloud drive, which is very awesome for geeks like me. The settings you can configure are things like the battery profile (lead acid vs lithium, etc) and low temperature cutoff (great for lithium) and they’re really simple to use. Victron has some good videos on YouTube on how to set these devices up, which helps because the manual leaves a bit to be desired. Another interesting feature that has tons of potential is the VE.Smart networking. From the app, I was able to quickly and easily create a VE.Smart network on the BMV-712, and have the solar controller join the network. Once this happened, the BMV started broadcasting its voltage data over Bluetooth, and the solar controller received the data. This is important because with this data, the solar controller can adjust its charge parameters to account for resistance and voltage drop in the cable. In addition, if you have battery temperature data from the BMV, it can adjust for that as well. I plan on adding a temperature sensor to my BMV soon to try this out. All in all I am thrilled with the BMV and SmartSolar controller from Victron. I had reserved expectations, so that I wouldn’t be disappointed if the software was not everything they said it would be, but I turned out to be wrong. The build quality is great, the software is great, and everything goes above and beyond their promises. I’m looking forward to adding a Color Control GX and MultiPlus inverter in the near future. UPDATE: I found that you can change the Bluetooth PIN code from the default. From the app, go into the settings, click the three dots in the top right and choose Product Info, and scroll down to the Bluetooth part and there you can change the PIN code. I wish this was easier to find 🙂 But still so far so good, this solar controller has been working very well. Used this charge controller with a 175 watt panel at 12 volts. It feeds the line in. The battery out goes to a dual Nissan Leaf module hooked up in series (16 volts). The load on the charge controller goes out to a voltage regulator to step it down to 12.8 volts and out to a series of USB ports and 12 volt lighters. Programmed the charge controller to 4 volts per battery cell at a max (16 volts, 64 ah). Used the lithium ion preset adjusted slightly. On the load output I set the limit to shut off the load when the voltage on the battery gets below 12.5 volts and stay turned off until the voltage on the battery rises up to 15.85 volts. In other words, this one box has made my setup thoughtless and automatic. So in cases where my fridge or other loads drains the battery to the minimum it will turn off the battery output until it charges enough to last the night without solar adding voltage. The bluetooth part is nice just to make programming easy and gather statistics. Can’t really complain about anything on the box or the functionality. It just works and includes enough options to make it seem like magic. Purchased this MPPT in February, I have not been able to get the “load” function to work. Despite having the app set to have the “load” always on, no current to the “load” port. Technical support from Victron is sadly lacking, with Customer Service referring me to the online manual instead of having a Tech person help me. Update: the vendor (Remote Power Source) sent me a replacement controller without hesitation. The replacement unit worked as designed. Not entirely satisfied with this controller. My main issue is the absorption “algorithm” which just decides by a certain end voltage before the sun comes back up, how long it stays in absorption mode. I have watched it go to float multiple times while the batteries are still pulling in 20+Amps and the BMS saying that there’s still 20+Amps till charging completes. This is terribly inaccurate and leaves the batteries being under charged… The proper method for charging is absorb until the current tapers down to .1C (1% of battery/bank) capacity. The app also isn’t that great and the Bluetooth range is really bad. Currently shopping for a different controller. This one will probably be going back before my brand new, very expensive battery bank ends up sulfated from under charging. Honestly, I’d be completely fine with this controller if they updated it to allow user programmable charge algorithms (without the use of their extremely over priced proprietary USB cable to alter code), or just the same “tail current” based algorithm that their own BMV-712 monitoring system uses to detect a full charge.